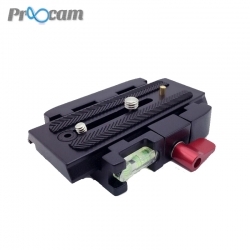 The Proocam Quick Release Tripod plate and Base system , Complete connect Adapter can be equipped with a camera plate that slides forward and back for macro positioning, and features a safety button that limits the amount of sliding on the quick release. Quick release plates are fitted into a compatible tripod's pan head or ball head quick release mechanism for easy removal and replacement of equipment. It has two bubble levels. Two threaded holes on the side of the quick release allow for storing the unused camera screw directly on the assembly.